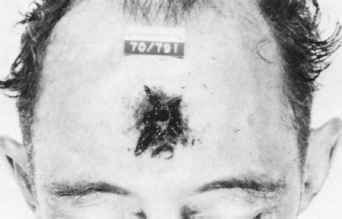 Figure 10.3 Contact wound of forehead from stud gun. of the bolt, though it is possible to overcome this. Injuries occur when the device is discharged at a range less than the length of the bolt. Most deaths from this device are accidental. Death is usually not immediate and prolonged survival may occur. The report by Betz et al. is apparently the first report of a homicide with this device in the English literature.10 The author of this book has seen only one death from a captive bolt device. This involved a 28-yr-old white male working in a slaughter house who was accidently shot in the head with a captive-bolt gun of German manufacture. At the time of the shooting, he was wearing a plastic safety helmet. Examination of the helmet revealed an 11 x 10 mm, roughly circular, punched out defect of the front 1/4 of an inch to the left of midline, with a black sooty deposit around the hole. 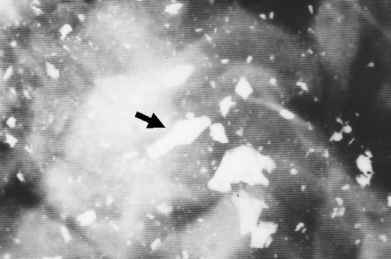 The bolt punched out an 11.5 mm entrance in the cranial vault, just to the left of the midline, adjacent to the coronal suture. There was a hemorrhagic wound track along the medial aspects of the cerebral hemispheres with disruption of the caudate nuclei bilaterally. At the end of the track was an 11.5 mm plug of bone and an 11.8 mm white plastic plug. The bolt gun had a three inch (7.5 cm) long bolt with a circular, sharp-edged, concave end, 11 mm in diameter.